It’s time again for a look at another 1/6th scale figure from Hot Toys. 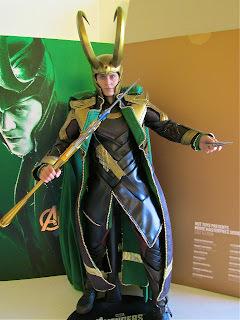 This time around I’ll be showing off Loki from The Avengers. Loki seems to have become a fan favorite in the Marvel Cinematic Universe mostly because of Tom Hiddleston’s performance as Loki, which can explain why this figure sold out so quickly. I personally did not think this would sell out until several months later, but it in fact, sold out within less than a day of it being in stock. I was lucky enough at the time to just bite the bullet and accept the fact I needed to complete my Avengers set. All in all I am very pleased to own this and glad to show it off today. Overall this figure looks great and is a great representation of the character. Not only is the head sculpt done well, but the slight smirk expression is a perfect fit for the character. This is a good sculpt of Hiddleston and the amazing paint apps helps to bring the detail out in his face. The costume is also intricately put together from the leather folds to the beaded hems all the way down to the aged plastic armor. This is a great piece of work from Hot Toys in this department. Accessories wise it comes with a good amount of different display options. He comes with two different sized staves. One is the smaller staff he carries around with him for most of the movie and a 12inch staff that seen in the Battle for New York. Other props he comes with are two daggers that he stabbed Thor with, a muzzle, a pair of handcuffs, a detachable cape, and his helmet. My only gripe with this figure is his helmet. The helmet looks great, but it is pretty tough to put on. This helmet is assembled and put on in two parts, just like it was for the real prop helmet (watch the special features in Thor). You first put on the bottom and then snap on the top portion, however, putting the two together can be real hard since they don’t seem to snap together correctly, making the helmet look like it doesn’t fit. I also had a little bit of a hard time getting on the handcuffs. You have to take off the hand and slip the handcuffs on the wrist and then put the hands back in their peg with the handcuffs now over the wrists. For me it just didn’t seem to get on correctly, and I had to loosely put them on for the pictures. 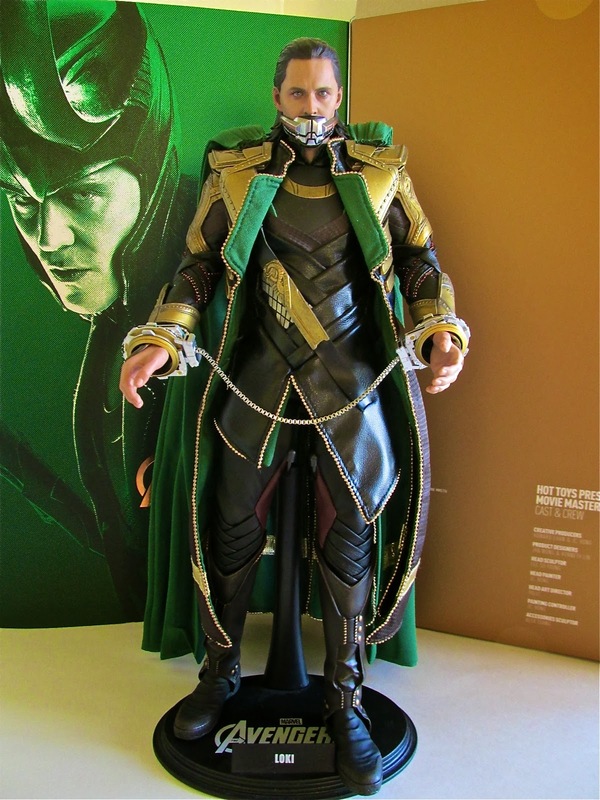 If you happened to miss out on this version of Loki, sometime later Hot Toys will be releasing Loki based on his appearance from Thor: Dark World. 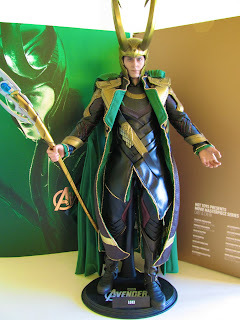 My suggestion is if you like Loki or a big Tom Hiddleston fan then I would immediately pre order the figure when it becomes available, otherwise, you maybe out of luck.